An AMBER ALERT has been issued for missing 5 year old Neviaeh Amyah Buchanan. The Monroe County sheriff’s department in Michigan states that the girl has been missing since 8:15 p.m. Sunday from the parking lot where the girl lives at the Charlotte Arms Apartments at 1166 N. Macomb Street in Monroe. Authorities found her bicycle in the parking lot of an apartment and believe she has been abducted and is in extreme danger. Anyone with information is asked to call 911 or the Monroe County Sheriff’s Department at 734-243-7070. According to the girl’s mother, her daughter was outside playing with a friend and stayed outside when her friend came into her home. 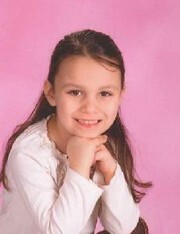 Buchanan’s mother tells Local 4 her daughter was outside playing with a friend. The friend came into her home and told the mother that Neviaeh was playing with her scooter. The mother went outside to tell her daughter not to go near the road, but when she got there the girl was gone. I hope this little girl is found safe. This is only 20 minutes from where i live. Oh Leroy, I hope she is also, a beautiful little one I will keep coming back today for updates on Neviaeh. This is what I dont understand about Amber Alerts....in following other cases on this forum like Sandra's, they did not issue an Amber Alert because they did not have a description of a person or vehicle. The same is true for this little girl. I am so glad they issued the alert Neviaeh....i just wish they would have done it for poor little Sandra...perhaps the outcome would have been better for her. The Amber Alert system has me very confused, it just doesn't seem to be consistent, I too am glad they issued an alert for Neviaeh. I'm trying to figure out how to pronounce her name, pretty name, but would not know how to say it. Clothing: Red, white and blue striped shirt, knee length blue jeans. This apartment complex is also pretty close to I-75, a major highway, which concerns me. There is supposed to be an 11am press conference....i will watch the local news at noon to see if there are any updates. Prays for her safe return and strength for her family. Thanks for posting this. It is good to read the police issued an amber alert and allowed common sense to lead them. I hope they find her soon. Were there any security camera's around? do we know how long it was before police were called? Thank-you, for the pronunciation of her name, and yes the fact that she lives by a highway is very scary. UPDATE: George Kennedy, who is the boyfriend of mother Jennifer Buchanon, was questioned by police Sunday evening, says the Monroe County Sheriff's Dept. We know that he remains in custody and that the search continues for 5-year-old Nevaeh Buchanan.